Your laptop is fully charged, your favourite playlist is on. You sink back into the soft sofa, grabbing an extra cushion for comfort. On the shelves behind you are postcards highlighting all your travel goals. When you get thirsty, you head into the kitchen. A press of a button and the most fragrant cup of coffee is ready. For some, this sounds like the most ideal day working from home. 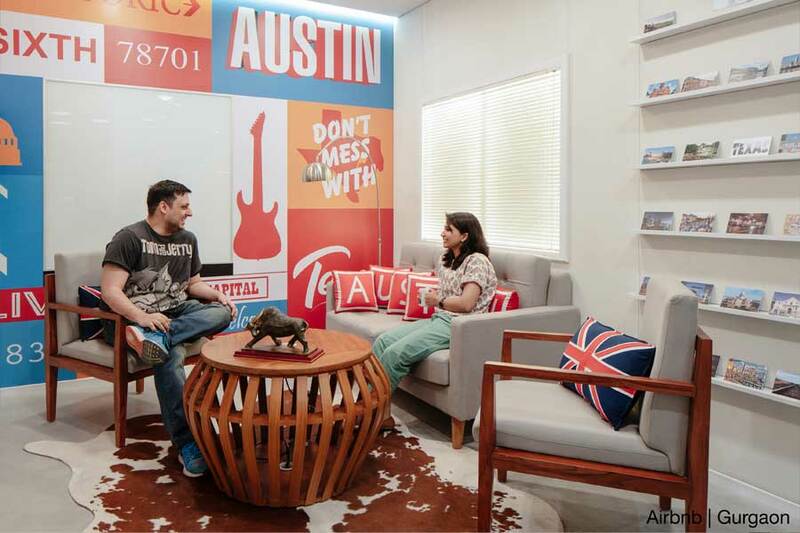 For Airbnb employees, this is a typical day, working at their Gurgaon office. Blurring the lines between home and office is the very idea behind the resimercial design revolution. 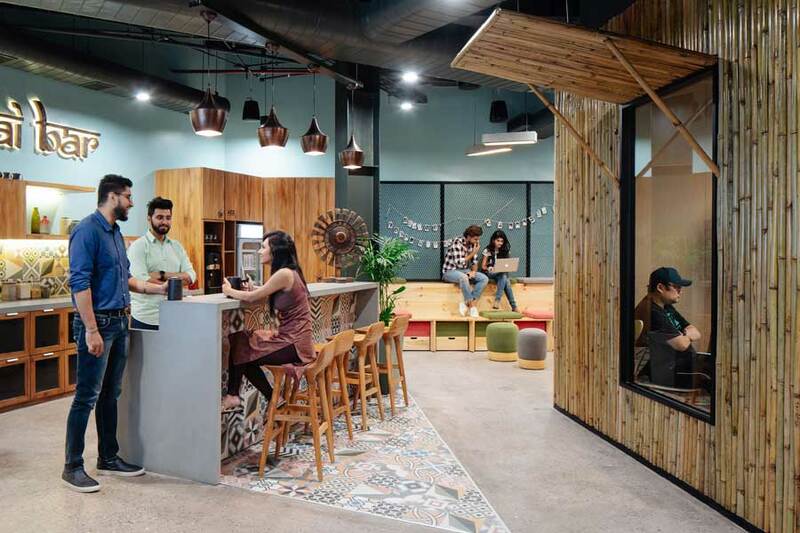 A move that brings the homely atmosphere of one’s house into the workplace, resimercial design caters to the changing needs of a new generation of workers – the millennials. A far cry from the stark, impersonal office interiors of the previous decades, resimercial offices are cosy, charming and inviting. It is a space that keeps you comfortable when the workdays are long; it is a space where you often find yourself relaxing for an hour or two, even after all your tasks are done. Always-on work culture: Employees do not expect to stick to a 9-to-5 schedule. They often work unconventional hours – brainstorming with their colleagues late into the night, or coming in early to connect with a client based halfway around the world. This kind of culture can get exhausting and demotivating if one is expected to sit in a stuffy, uncomfortable cubicle all day. Varied roles through the day: Employees today do not perform one task, all day, every day. Millennial workers detest monotony – so it is not uncommon to see someone take on a creative role in the morning, move on to operational tasks in the day, and put together a sales pitch later in the evening. It only makes sense to have different spaces for the different tasks one performs through the day. Changing attitudes at workplaces: There was a time when keeping one’s personal life separate from the professional was good advice. But today, that no longer holds true. Younger employees don’t just want to work and go home – they look to form meaningful relationships with the colleagues they work with. Co-workers become more like extended families, often sharing meals, laughs or a post-work drink. Resimercial spaces cater to this change in professional behaviour much better than traditional offices. Within a home, the drawing room is the space where the entire family gathers to talk to each other and to entertain friends and family. 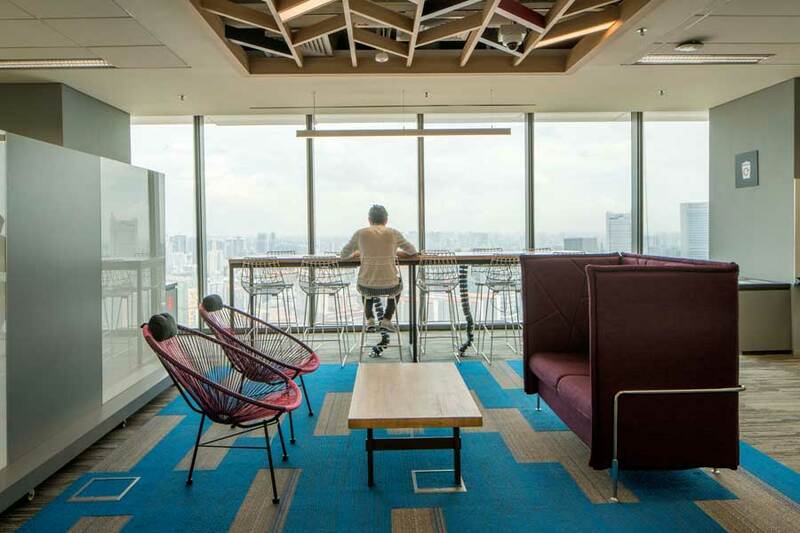 Resimercial workspaces embrace the relaxed vibe of a drawing room, and translate it into warm, inviting lobbies and beautifully designed common areas where employees can brainstorm and ideate. Rather than bland, impersonal furniture, resimercial ‘drawing rooms’ are made cosy with sofas, colourful rugs, cushions and casual seating options like bean bags. Families often put a lot of thought into doing up their drawing rooms, as it is a space for them to showcase their personal style to guests. Likewise, in an office, the lobby or the reception area is a great place for a company to define its brand for visitors. We leveraged this while designing the LinkedIn office in Bangalore. 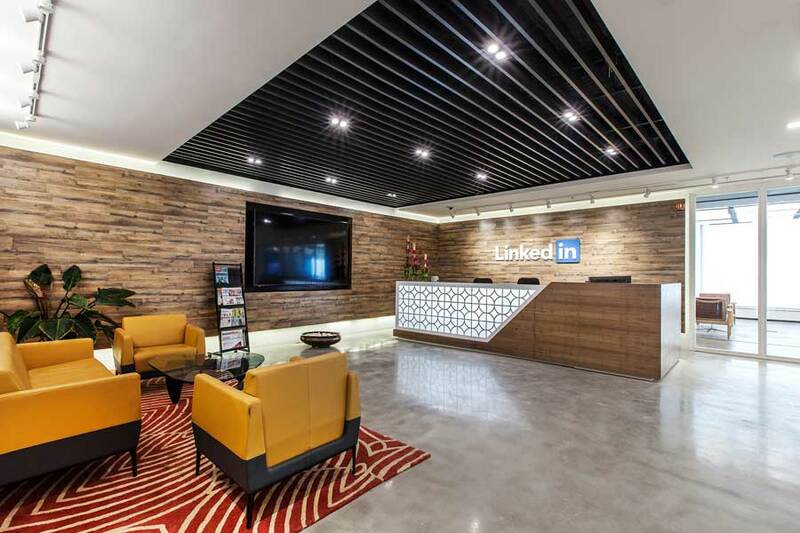 LinkedIn is all about networking and making connections with one another, so we included comfy sofas arranged in a semi-circular layout in their reception area. This enables people to sit facing each other, so that no one person in a group obstructed from view. The colourful rugs and the potted plants enhance the warm vibe of the room, making it more homely and inviting. Often referred to as the heart of a home, the kitchen is a relaxed space for a family to catch up over a warm meal at the end of a long day. 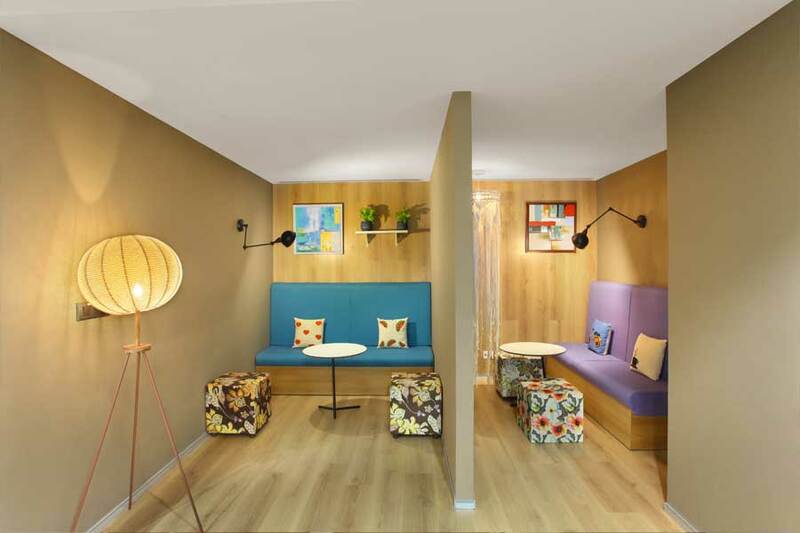 Companies today are realising the potential of such relaxed spaces within their offices too. Modern offices are moving away from the industrial canteens of the past, and are opting for chic cafés or pantries instead. Equipped with big tables, low and high seating options and colourful lamps and kitchen accessories, these family-style dining areas invite employees to socialise and bond over food and drinks. The Chai Bar at the Airbnb office in Gurgaon is a prime example. 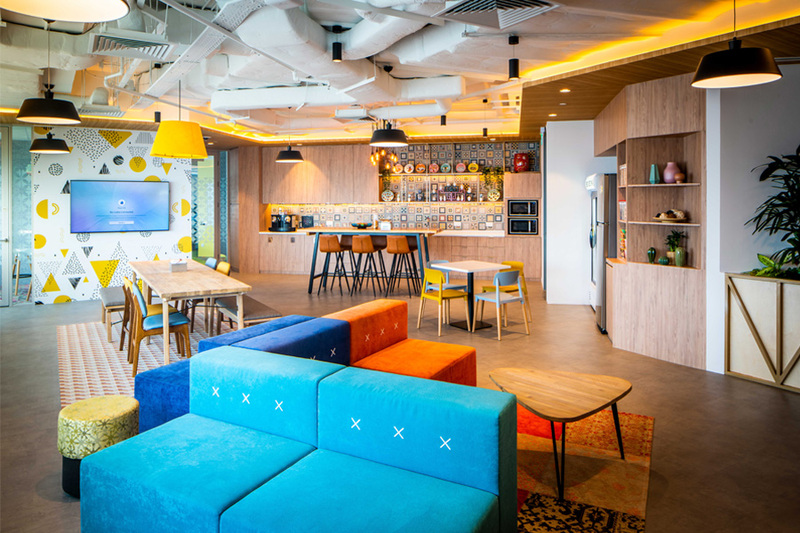 Done up in soothing wood and bamboo tones, and accentuated with vibrant hues, this Chai Bar is a popular hangout for employees. The long table and bar stools accommodate bigger groups, while the colourful stools and cushioned benches make great spots for an impromptu brainstorming session. In a big family, evenings can often get loud and boisterous once everyone is home. Many homes have a study or a designated quiet area, where one can retreat when they need to do their homework or take an important call. In resimercial workspaces, this translates into specially designed work pods or nooks where one can concentrate on focussed tasks. Solitude and comfort are the highest priorities here. They are usually fitted with acoustic furniture and panels to muffle noises and minimise distractions, and often include seating options in various heights for maximum comfort. When we designed Weber Shandwick’s Gurgaon office, we put special effort into creating such strategic nooks to maximise workplace productivity. When they need to write a detailed report or work on a crucial presentation, employees can head to these peaceful spots in the office, sectioned off from each other and done up in natural hues. They can curl up on the colourful sofas, grab a couple of cushions, and put their feet up on the low stools. The adjustable arms on the lamps let them angle the lights to a precise degree, thereby avoiding harsh glares on their screen. The most fun room in a house, the game room offers a space for kids to play and be boisterous, and for parents to relax after a long day. Whether they are gathered there for board games or are all huddled up for a movie night, this is a room that brings people together as a family. In an office, a game room offers employees a much-needed space to unwind and de-stress. There’s nothing like a game of foosball or table tennis to bring out the streak of friendly competition among colleagues. Widescreen TVs are another great addition in such entertainment rooms, as they encourage co-workers to gather here to watch live matches. 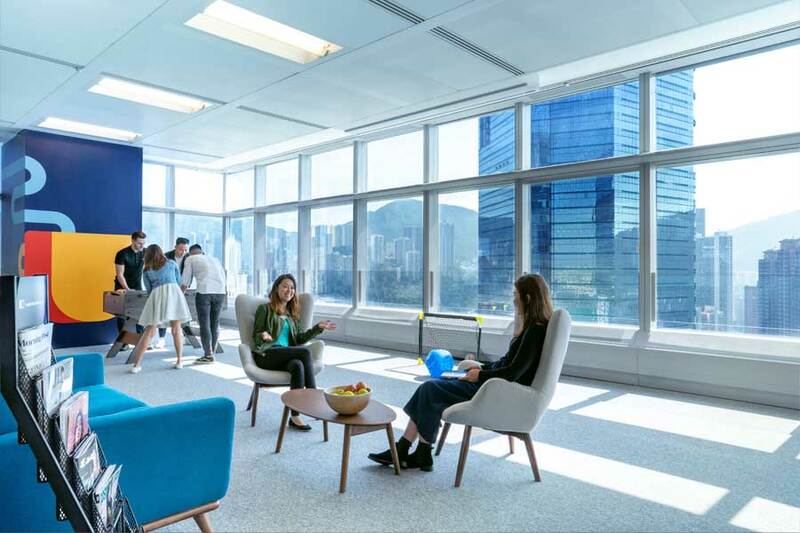 For Randstad’s workspace in Hong Kong, we also added in some stylish chairs, coffee tables and racks of magazines. Employees love curling up here for a chat with snacks and magazines and enjoying the natural sunlight that streams in through the wall-to-wall windows. Intrigued by this direction of workspace design evolution? We can advise you on the best ways to incorporate resimercial strategies in your offices. Reach out to us for a consultation.